If you need assistance collecting back child support, retaining a skilled Florida child support attorney is a good place to start. There are a number of ways that you can try to collect back support, but it’s helpful to have an attorney to help you through the process. The DOR can start sending late payment notices to start the collection process. The DOR can withhold income to get the payments caught up. This may include a garnishment order. The delinquent parent’s driver’s license may be suspended if they do not pay what is owed, sign a written agreement stating they will pay back ordered support, or file a petition to contest what is owed. The delinquent parent’s other licenses can be suspended as well. This includes professional, business, and/or recreational licenses. If the delinquent parent has a federal tax refund coming due, that can be withheld to pay back support. Lottery winnings of more than $600 in the state can be withheld to cover the amount of back support. If the delinquent parent is receiving workers’ compensation benefits, or reemployment benefits, those may also be tapped. Up to 40% of reemployment benefits can be deducted to cover the past due amount. There are ways to attach personal property liens to a boat or vehicle as well, provided there is at least $600 in back support owed. If your ex owes $2,500 or more, you can arrange that he or she cannot get their passport renewed. Be present at follow-up compliance hearings. 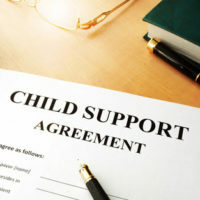 Unlike some states, Florida doesn’t have a statute of limitations on child support payments. This means you have the legal right to collect back child support even years after you no longer have a valid child support order. Waiting is never a good idea, which is why you should speak with a Boca Raton child support attorney as soon as your ex stops paying. Contact the Law Offices of Schwartz | White today to schedule a consultation. Let our team of skilled Florida family law attorneys help get the back child support that is owed to you.